Tirumali Krishnamacharya (1888-1989) is also known as “The Father of Modern Yoga”. He was born in the south of India, in a Brahmin family and was trained in the study of the Vedas by his father, the Vedas are the basis of what is known as Hinduism. He was an avid student and obtained various university degrees in different subjects as the Vedas, Ayurveda, Astrology, Indian Philosophy and Yoga. He traveled to the Himalayas and Tibet to study with the great teachers and to deepen his Yoga knowledge. For years he studied the Yoga Sutras and practiced asanas and pranayama, a practice he kept doing up to his last days. Krishnamacharya was married and had six children, although he lived with a strict (monk-like) discipline, he practiced his rituals, yoga asanas and pranayama daily, as well as teaching Yoga to his children, students, different personalities and even the Royal Family of Mysore. The basis of Krishnamacharya’s teaching was “to teach what is appropriate for the individual”. He probably would have been surprised by the way Yoga is taught now, in big groups, although Krishnamacharya could very well see and understand how the times were changing and he himself would use back in the day some “marketing” techniques to promote yoga, what he would call “propaganda”, things like stopping his own heartbeat. The ultimate purpose of Yoga and Pranayama is, however, to still the fluctuations of the mind. Krishnamacharya also applied and taught Yoga as therapy to help people with illnesses or injuries. Krishnamacharya was probably the first Yoga Master to introduce the concept of “Vinyasa”. Vinyasa means “step by step” or “putting one thing after another”, it consists of moving from one asana or position of the body to the next, linking breath with movement. This makes the Yoga practice more dynamic. This also shows how Krishnamacharya brought certain innovations to the evolution of the Yoga, since in the Hatha Yoga Pradipika (one of the oldest Yoga texts) the concept of Vinyasa is not mentioned. A good asana practice also should include staying in a position for a few breaths, since physical and mental benefits come when we are able to breathe long and quietly while holding an asana longer. Krishnamacharya devoted his life to the practice and study of Yoga, he was a scholar but also a vivid practitioner, a healer and a teacher of teachers. Krishnamacharya passed away peacefully in the quietness of his home on February 28th, 1989. Krishnamacharya had many devoted students, a few of them became really well known in the West, they travelled to America and Europe to transmit Krishnamacharya’s teachings. K. Pattabhi Jois (1915-2009). He started studying with Krishnamacharya since he was a teenager, Krishnamacharya would take him for demonstrations and K. Pattabhi Jois would also teach at the Yogashala of Krishnamacharya. K. Pattabhi Jois travelled to California on a yearly basis, making the beginning of the Astanga Vinyasa yoga in the US. Astanga Yoga is named after the eight limbs of Yoga explained in the Yoga Sutras of Patanjali. This method of Yoga consists in different sequences, also known as “series” that can be practiced alone under the watch and adjustments of a teacher (Mysore Style) or following the instructions and sequence from the teacher (Astanga Led). B.K.S. Iyengar, (1918-2014). T. Krisnamacharya was married to B.K.S. Iyengar’s sister, they were brothers in law. He asked B.K.S Iyengar to come to Mysore to practice Yoga to improve his poor health at the age of 15. Because of Iyengar’s poor health as a child he studied Yoga determined to improve his physical health. B.K.S. Iyengar’s method is well known for its precision, and the ability to make the practice of Yoga available to every individual body, no matter the age or physical health of the individual . 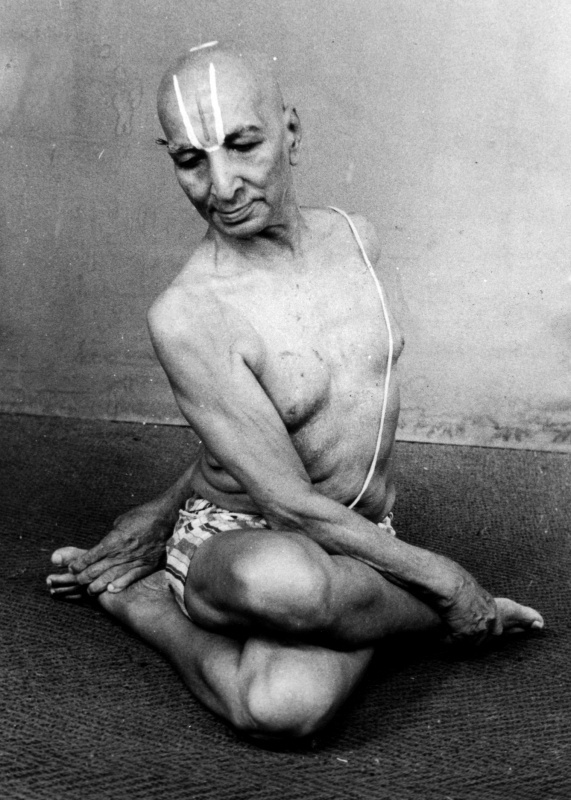 When Krishnamacharya saw B.K.S. Iyengar teaching with such knowledge, precision and clarity he personally told B.K.S. Iyengar to go and teach in public, to many people, not only in private. B.K.S. Iyengar has written books about the Sutras of Patanjali, Pranayama, and Yoga philosophy. He is the author of the best seller “Light on Yoga”, a book where he describes each asana in detail and gifts us with many sequences to help various ailments and to establish a daily home practice. Indra Devi (1899-2002). Originally from Russia, she was very attracted to India from a young age, she travelled to India and T.Krishnamacharya accepted her as his student, making her the first woman (outside of his family) to study Yoga among all the other male students. Indra opened a Yoga Studio in Hollywood, making yoga very popular among the celebrities of those days. Later she moved to South America (Mexico and Argentina), bringing Yoga to South America, she could teach yoga in many languages which was useful for spreading her deep knowledge of traditional Hatha Yoga, as taught to her by her guru T.Krishnamacharya. T.K.V. Desikachar (1938-2016). He is T.Krishnamacharya’s son and student, although, before he studied with his father he went to University and completed his studies in Engineering. He studied Yoga, Pranayama, Philosophy and chanting with his father. He wrote the famous book “The Heart of Yoga; Developing a Personal Practice”, the core of Desikachar’s teaching is to adapt the practice of Yoga to each individual, just as his father taught him, also taking into account the changing needs of the individual in each stage of his or her life. A.G.Mohan (1945-present). He was a personal student of Krishnamacharya for 18 years. He helped organize T.Krishnamacharya’s 100 years celebrations and is one of the few to obtain a Yoga Certification from Krishnamacharya. A.G. Mohan is the author of various books about Yoga Therapy, he also wrote the book “Krishnamacharya, his life and teachings”, a beautiful, almost diary like book of the relationship between AG Mohan and his master Krishnamacharya. AG Mohan together with his wife Indra, founded Svastha, Yoga and Ayurveda, and they still travel the world spreading the teachings of Krishnamacharya. “Yoga is an awareness, a type of knowing. Yoga will end in awareness. Yoga is arresting the fluctuations of the mind as said in the Yoga Sutras (of Patanjali): citta vritti nirodha. When the mind is without any movement, maybe for a quarter of an hour, or even quarter of a minute, you will realize that yoga is of the nature of infinite awareness, infinite knowing. There is no other object there.” – T.Krishnamacharya in an interview with A.G. Mohan.